The players in the $2,500 Main Event are now on a 75-minute dinner break. 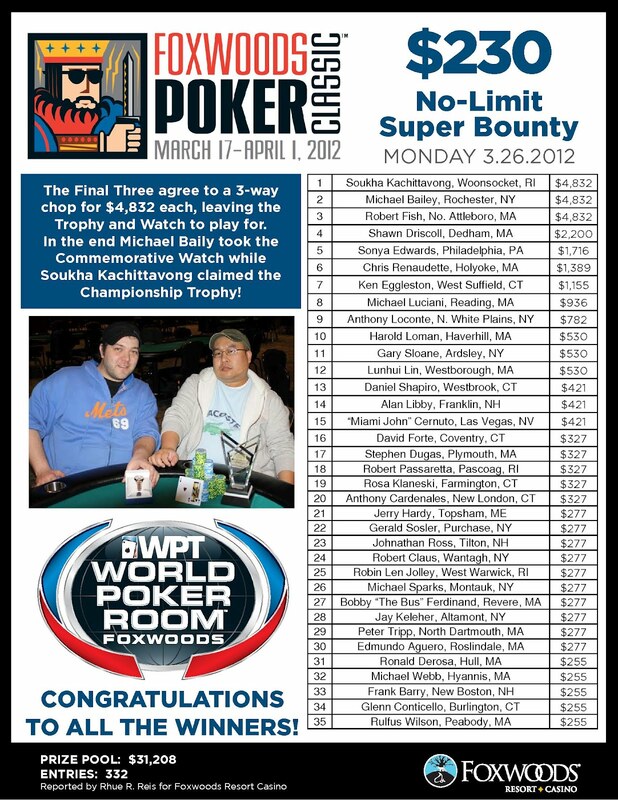 Paul Snead Rivers a Monster Pot to Top 200,000! Snead's opponent is ahead with the pair of jacks but the [5d] on the river gives Snead his flush and the biggest pot of Day 1. Paul Snead now sits on over 200,000 chips with the average at just over 50,000. 51K on break going to 200/400/50. Table is still amazing. 13.3k on break going to 200/400/50. Flatted Bryan's open w QQ last hand and jammed over his c bet on 764dd and got a fold. 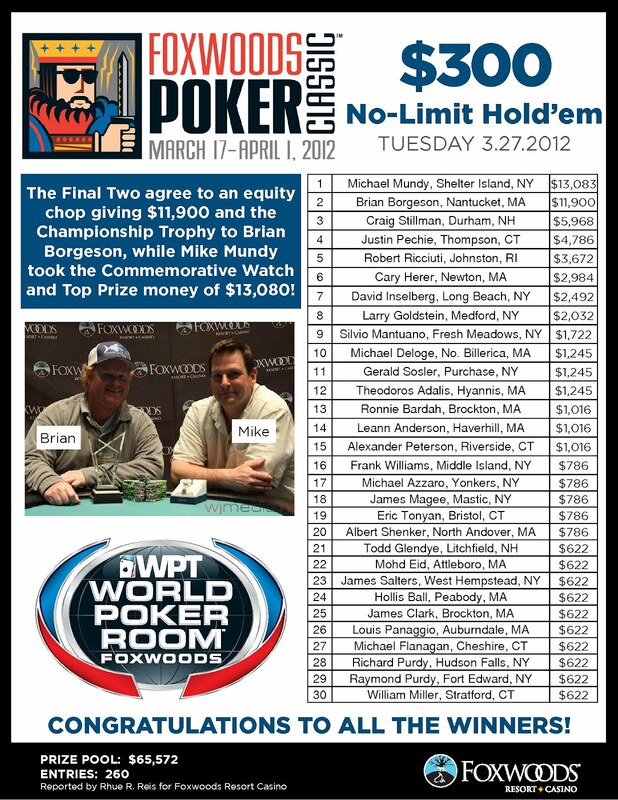 We had a total of 294 players in the $2,500 No-Limit Hold 'em Main Event at the 2012 Foxwoods Poker Classic. 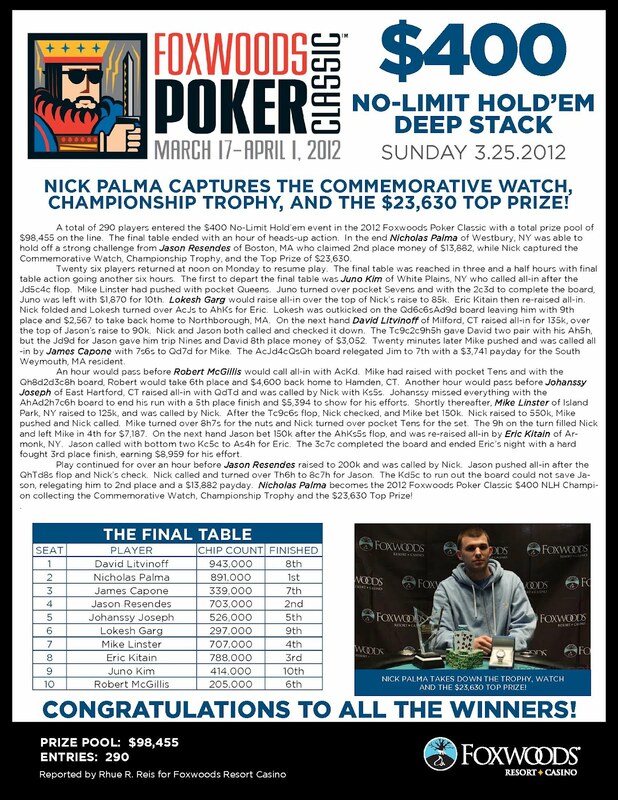 “@kjllove: @FoxwoodsPoker @jcamby33 nice job on the royal flush, must be your lucky day maybe mega millions later :)” I hope so! James Campbell calls a preflop raises along with the button and both blinds. The flop comes down Kx[Kc][Qc] and it is checked all the way around. The turn is the [Ac] and the original raiser bets 800. Campbell raises to 2,200 and is only called by the player on the button. The river is another queen and Campbell fires 5,000. The button quickly min-raises to 10,000 and Campbell moves all-in. The button calls immediately, turning over K-Q for a flopped full house. However, Campbell shows the [Jc][Tc] for a turned Royal Flush to take the huge pot. Campbell is now sitting on around 75,000 in chips. 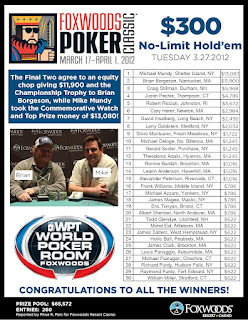 The players have just returned from the first break at the 2012 Foxwoods Poker Classic $2,500 Main Event. 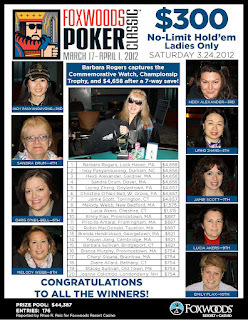 There are currently 277 players in the field with registration open for another two levels. With registration open for the first four levels of play, there are already over 270 players signed up for the $2500 Foxwoods Poker Classic Main Event! Players start with 40,000 in chips and the levels are 60 minutes in length. Rippin day 15 of juice fast, dwn 20 pounds or so, feelin groovy.Time to rip @foxwoodspoker Main Event!! Playing $2500 @FoxwoodsPoker Classic Main Event today. 40K starting. 260 runners so far. Congrats again to my girl @NikKiDeFran on her win! 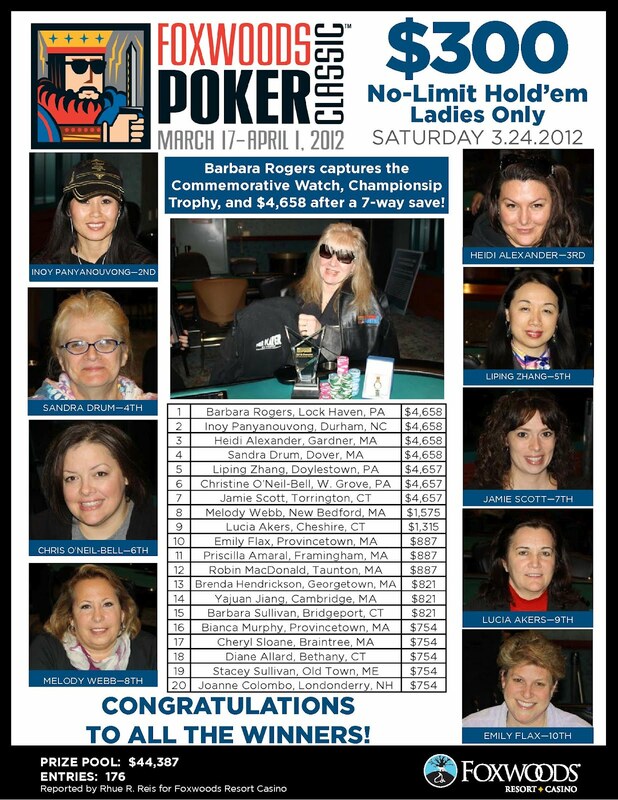 2012 Foxwoods Ppker Classic Main Event is Underway! 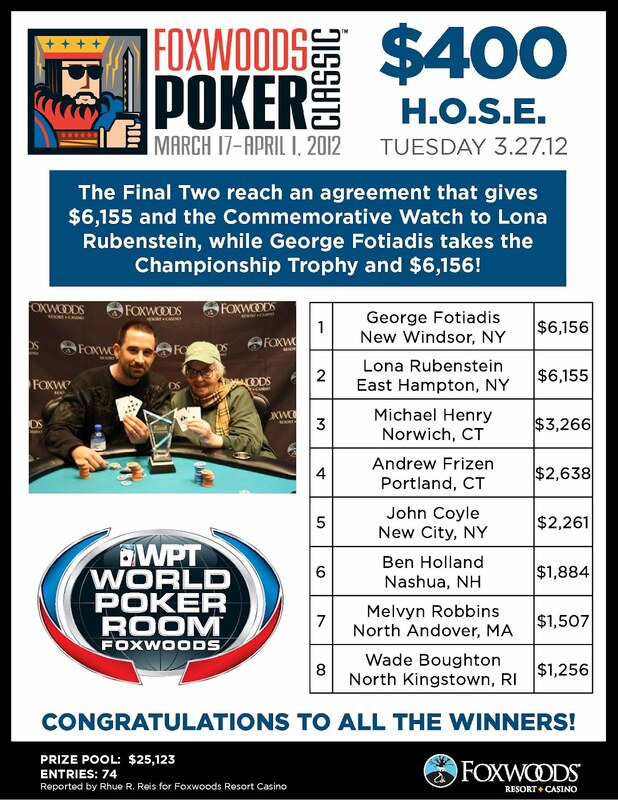 The $2,500 No-Limit Hold 'em Main Event at the 2012 Foxwoods Poker Classic is now underway! Players start with 40,000 in tournament chips. The blinds are starting at 25-50 and levels are 60 minutes in length. Bobby Ferdinand & Silvio Mantuano Chop the $1,000 Deep Stack Event! 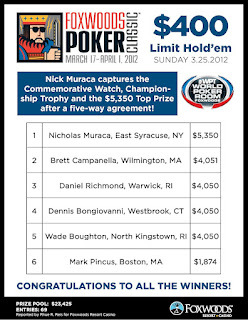 Once heads-up, Bobby Ferdinand and Silvio Mantuano decided to chop the remaining prize pool by chip counts. 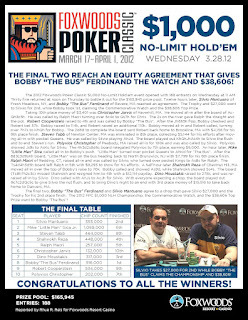 Bobby Ferdinand takes home $38,606 while Silvio Mantuano pockets $27,000! The board runs out [9c][7c][2d][Qc][5c] and Mantuano hits a four-card flush to take the pot, eliminating Moustakis in 3rd place for $15,516. The board runs out [Tc][8h][7h][2c][3c] and Ferdinand takes the pot. Reza is eliminated in 4th place for $12,114. 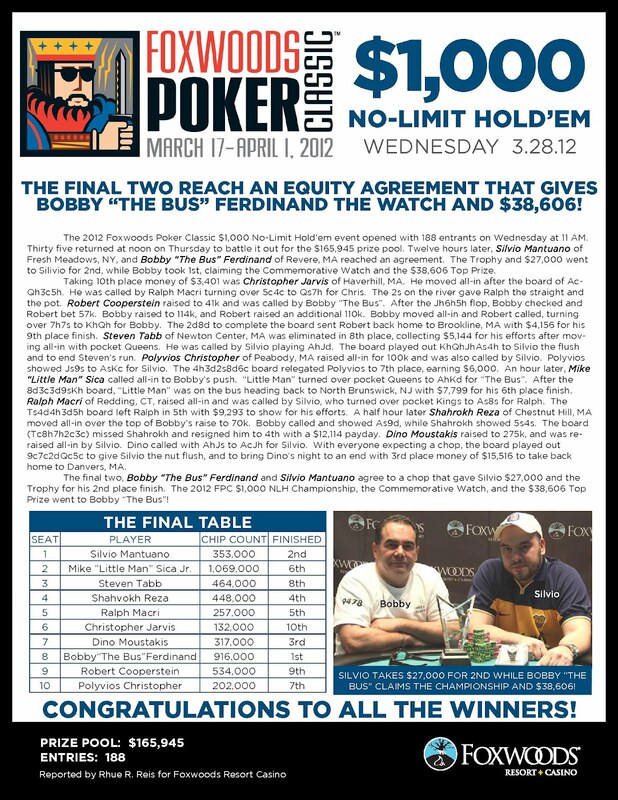 Bobby Ferdinand now has over three million of the 4.7 million chips in play. The board runs out [Ts][4d][4h][3d][5h] and Mantuano's kings hold up. Ralph Macri is eliminated in 5th place for $9293. The board runs out [8d][3c][3d][9s][Kh] and Ferdinand spikes a king on the river to win the pot. "Little Man" Mike Sica is eliminated in 6th place for $7,799. The board runs out [4h][3d][2s][8d][6c] and Mantuano wins the pot. Polyvios is eliminated in 7th place for $6,389. The flop comes [Kh][Qh][Jh] and Tabb flops a set of queens. However, Mantuano is four to the flush. The turn is the [As] but the river comes the [4h]. Mantuano hits his flush, sending Tabb to the rail in 8th place for $5,144. 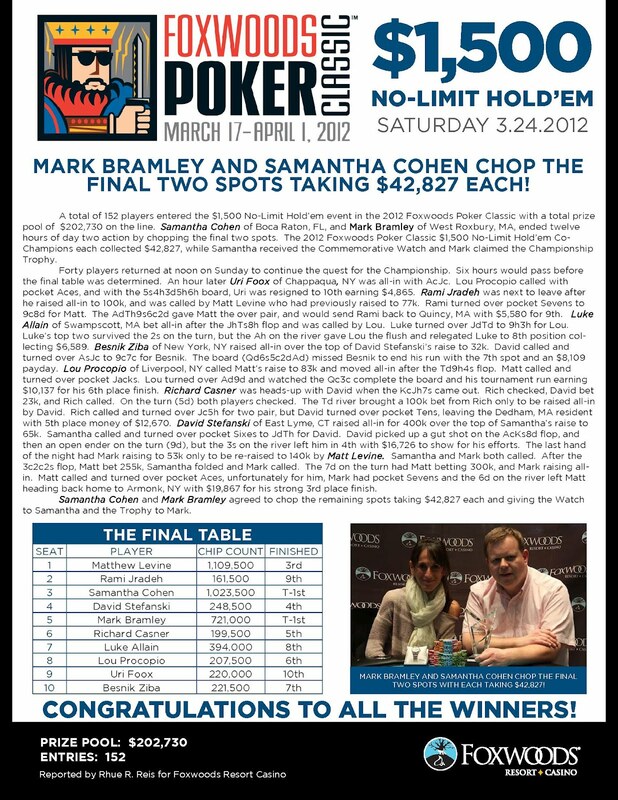 Bobby Ferdinand limps in for 16,000 before the flop and Robert Cooperstein raises to 41,000. Ferdinand calls and the flop comes [Jh][6h][5h]. The turn is the [2d] and the river comes the [8d]. Ferdinand wins the pot with his flopped flush. 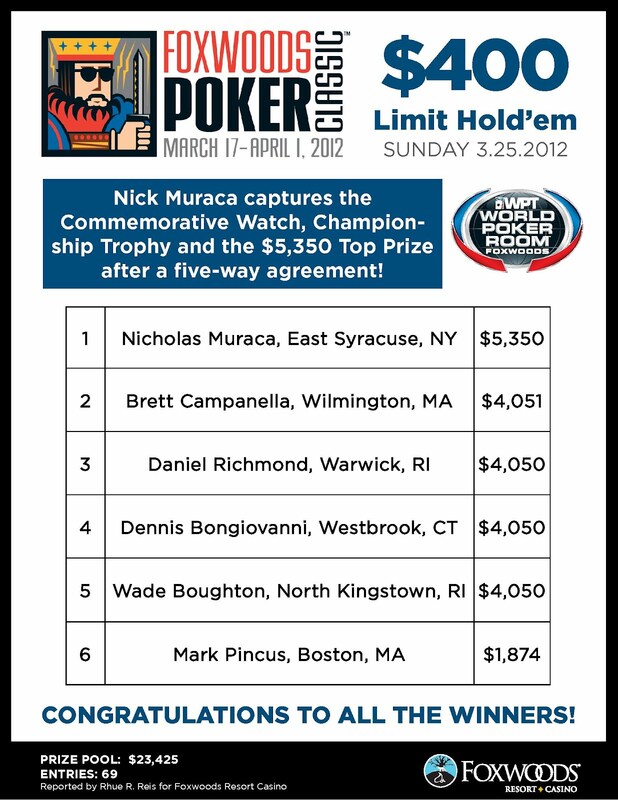 Cooperstein is eliminated in 9th place for $4,156. 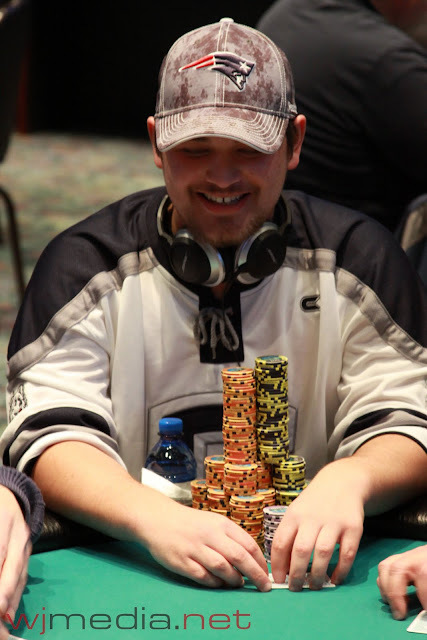 The river comes the [2s] and Macri makes a straight to take the pot, eliminating Jarvis in 10th place at the $1,000 Deep Stack final table for $3,401. We are down to the final table of the $1,000 Deep Stack event. 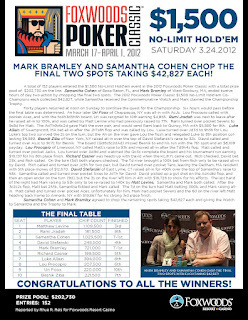 We had a total of 205 players in the $500 No-Limit Hold 'em Six-Max event at the 2012 Foxwoods Poker Classic. The final 24 players will finish in the money. $1,000 Deep Stack Event is Now in the Money! We are down to 27 players and the final three tables of the $1,000 Deep Stack event. Day 2 of the $1,000 Deep Stack Now Streaming Live! Day 2 of the $1,000 Deep Stack event is now underway. There are 35 players remaining and the average chip stack is 134,300. Play has come to an end on Day 1 of the $1,000 Deep Stack event. The blinds will start tomorrow at 1,500-3,000 with a 400 ante. $300 Deep Stack Now in the Money! The $300 Deep Stack event is now in the money. 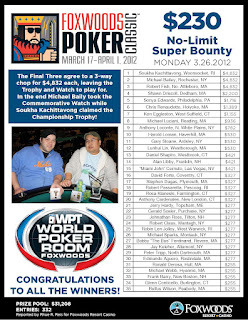 You can watch the live stream of the feature table with Ronnie Bardah in the three seat at FoxwoodsLive.com. We had a total of 74 players in the $400 H.O.S.E. 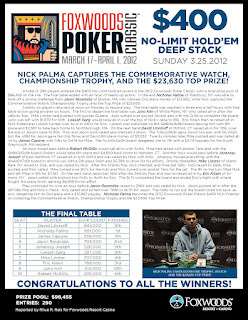 event at the 2012 Foxwoods Poker Classic. The final 8 players will finish in the money. 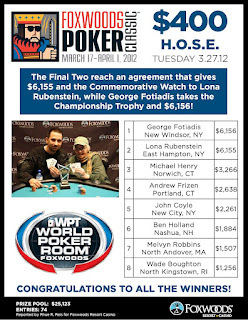 We had a total of 260 players in the $300 No-Limit Hold 'em Deep Stack event at the 2012 Foxwoods Poker Classic. The $300 Deep Stack No-Limit Hold 'em event is now underway.